Bak Kut Teh – a famous traditional Singaporean and Malaysia pork ribs soup served with rice, you tiao dough sticks, chilli dipping sauce and a good strong pot of Wuyi Shuixian oolong tea. This dish is sometimes made with chicken or duck. It was Singapore’s 45th National Day (Happy Birthday Singapore!) on Monday. As I watched the national day parade live webcast, a lot of childhood memories came flooding back. Being the glutton that I am, I cannot help but think of all the delicious hawker fares that I grew up with. So I decided to take a break from translating the Lu Yu’s Classic of Tea to talk about this delicious and very well known Singaporean (some say Malaysian) hawker fare. “Bak kut teh” is a rich and nourishing brew that boasts of tonic herbs. Traditionally enjoyed as a rather masculine breakfast, it is now more likely to be consumed over lunch or dinner as a satisfyingly comforting meal. Darker and more oxidised teas (typically Iron Goddess of Mercy or “Tie Guan Yin”) are frequently served with the soup. There is something very gratifying (or in Singlish “Shoik”) eating this hot meal and drinking hot tea in hot and humid Singapore (See “hot teas for hot days” blog post). “Bak kut” is pork bones in the Chinese dialect of Hockkien. “Teh” is the Hockkien word for tea. The soup is typically cooked with pork ribs seasoned with Chinese herbs and soy sauces. It is served with rice, “xian cai” (咸菜. Salted mustard leaves), “you tiao” (油条. Deep fried dough sticks) and sliced red chilli in dark soy dipping sauce. The meat is cooked till it is practically fallen off the bone. The broth is bursting with meaty umami flavours and has a hint of dark caramelised sweetness from the soy sauces. The hits of pepper and garlic provide a very good background for these flavours. I am aware that most people might be a little put off by the dark colour of the soup (as with spaghetti made with squid ink!) 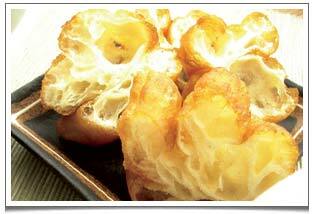 but I can assure you that you will be amazed at flavours and the comfort it will bring to you. You Tiao – sliced fried dough sticks. Adding a slight crunchy and chewy texture and provides a nutty backdrop to the Bak Kut Teh soup. To go off the tangent for a bit regarding the character teh – tea is also known throughout the world now as variations of the words “chai” or “teh”. What a country calls this humble beverage made from leaves really depends on how tea was first introduced to its people. European and South East Asian countries who received tea via the sea route from the ports of Xiamen in Fujian Province adopted variations of Hockkien word teh (so “thé” in France, “tee” in Germany, “té” in Spain and “tè” in Itay and “teh” in Malaysia and Singapore). While counties receiving tea by land instead adopted the Mandarin pronunciation of “cha”. Hence we have “chai” in Russian and Arabia, “chay” in Turkey and “cha” in Portugal and Iran. There are many origins for Bak kut keh. Some of them are romanticised versions, concocted by families in China, of the life lead by men who have gone to “Nanyang” (南洋. South Seas – referring to Malaysia or Singapore by the Chinese) to earn their fortunes. The most credible story for this soup has to be the one associated with the coolies who came to Nanyang to earn a living as manual labourers at the docks. Some says the dish was created in Singapore but other says it originates from Port Klang in Malaysia. Some of these coolies would typically come from Xiamen (Hockkien speaking) and Swatow (Teochew speaking). The Hockkiens and Teochews are traditionally tea-drinking cultures and this aspect runs deep in their cuisines. These dock labourers led a very hard life (many of them have been sold as slaves or tricked to work as labourers) carrying heavy sacks of cargo from vessels to the warehouses for very little money. To supplement their diet, they would pick up bits of herbs or grains dropped on the ground from the sacks they carry. These men would gather their meagre resources to buy some pork bones and add their collected herbs to make a nice nourishing soup which they will eat with rice for breakfast. This hearty soup provides them with energy for another hard day’s work. Now, there are regional variations to this soup. Bak kut teh made by the Hockkiens were usually heavier and darker as they used more dark soy sauce while the Teochews prefer a lighter in colour, more peppery soup base. This dish continues to evolve. I have seen pork being replaced by chicken (“Ji Ku Cha” 鸡骨茶) or duck (“Ya Ku Cha” 鸭骨茶) so that our Muslim friends can also enjoy it. I have also seen a “dry” version of this soup in Port Klang where the broth is reduced to a thicker gravy and the addition of dried cuttlefish, goji berries and Chinese red dates making it even full-bodied than the ones I know. 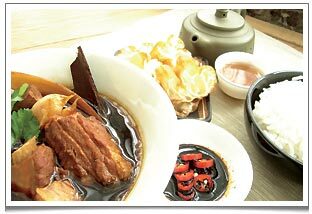 A famous Singaporean hawker fare “Bak Kut Teh” – Pieces of succulent pork ribs in a dark soy sauce broth favoured with garlic, goji berries, cinnamon bark and licorice root. Even though the name of this soup suggests that it is cooked with tea or enjoyed with tea, there is not much historical evidence of these coolies having their daily breakfast of bak kut teh with tea. In fact, this dish was simply called “Jia Bak Kut” (吃肉骨. Meaning eating pork bones in Hockkien) at that time. Soon after the Second World War, a Hockkien man called “Li Man Teh” (李文地) decided to set up a stall selling his version of this soup with Chinese medicinal herbs (sometimes contributed by these coolies). Mr Li’s soup was very popular and his customers gave him the nick name of “Bak Kut Teh” by adding the last character of his name teh (地) to Bak Kut (pork bones). This last character of Mr Li’s name happens to have the same intonation as the Hockkien word for tea (“teh”. 茶). 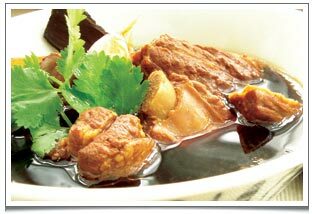 Over time, this soup became what we now know as bak kut teh (pork ribs tea). As far as my memories go, tea is more of a beverage to accompany this meal. The dark roast tea not only compliments the meaty umami flavours of this soup but also helps to reduce the cholesterol intake and aids digestion. Typically, customers are served with the soup, a bowl of rice and condiments together with a simplified Gong-Fu Cha tea set for brewing a dark roast oolong tea like traditional Tie Guan Yin (Iron Goodness of Mercy). I discovered later that this style of enjoying the meal is more a custom of Teochew people. The Hockkiens also consume this meal with tea but they would simply drink the tea from a bowl. Sometimes, they even pouring tea into the emptied rice bowl to pick up any remaining flavours of the soup! One of the herbs used in this delectable soup is the Chinese Angelica root (“dang gui” 当归). This is a highly sought after herb for easing many women’s ills and aliments as it is said to help in rebuilding blood and general weakness and lethargy. It is hard and knobbly and emits an earthy and warm woody aroma that will develop very strong flavour in the soup and should therefore be used sparingly. Herbalists typically advise that one should avoid consuming other strong herbs such as ginseng or the more Yin fruits soon after or before consuming angelica roots so as not to counteract the benefits of this wonderful herb. For this blog post, I have made my mom’s version of the soup that is slightly less herbal but still packed full of flavours. The you tiao dough sticks that you see in the pictures are from my favourite bakery in Chinatown. I have bought lots for my breakfast of rice congee and century eggs or over a thick bowl of soy bean milk. To revive them, I have put them under the grill for 3-5 minutes. Nothing beats a freshly fried crunchy you tiao! If there are any left over bak ku teh, my mom would add cooked vermicelli noodles to soup garnished lots of red chillis and corriander. A delectable night snack for me! – Bring water to boil in a large saucepan and add all other ingredients to the pot. – Bring to a boil. Then simmer over low heat for 1 hour or till meat is tender. – Serve with garnish and steaming hot rice, you tiao, some steamed pak choi and a good strong pot of oolong tea like Wuyi Shuixian or traditional Tie Guan Yin. ** To make a vegetarian version of this soup, replace the pork with dried bean curd skins (similar to Abura-age), “mu-er” Wood ears (black fungus) and dried and fresh shiitake mushrooms. Add the bean curd skins and fresh shiitake mushrooms about 5 minutes before serving. Enough of nostalgia, now back to my translation of chapter 4 of Lu Yu’s Classic of Tea but only after I have devoured this delicious bak kut teh! I love nostalgia! I particularly enjoy reading blog posts that reference childhood memories, especially when they are very different to my own. Thanks for sharing! I am very glad you find this post interesting. I will go back to my past more often to dig out more childhood favourites! Awesome recipe – I need to try your mom’s simplified version! thank you!